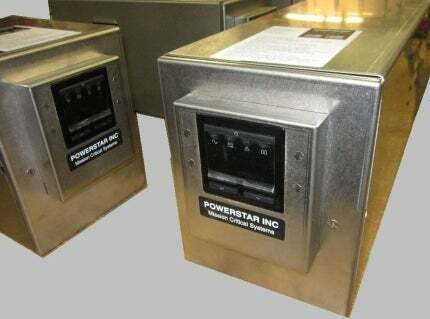 Powerstar manufactures customizable rugged Uninterruptible Power Supplies (Shipboard UPS) for shipboard services on oil platforms, marine vessels, and the military and homeland defense sectors. Powerstar uses state-of-the-art, high-quality APC™ and Liebert™ motherboards in their products, which are converted and ruggedised for shipboard applications. Be safe; don’t put your sailors at risk of being shocked. Use power supplies built for the special ungrounded Delta power used at sea. Powerstar also produces units with isolation transformers internally contained within the cabinet, providing a high-level of safety and electrical noise immunity. The company also builds military-grade versions of these units for high shock and vibration locations. It also supplies and manufactures Power Distribution Units (PDU). Powerstar offers small, cost-efficient 330W to 425W brick shaped surge suppressor/UPS for either 120V or 230V. The lightweight PS502 line can be used for a PC, printer or any low-power requirement. A ten-year battery pack is also available, which that can double the maintenance replacement period. The PS502 series connects via USB to inform the PC of UPS alarms and when to begin graceful shutdown upon loss of AC power. Powerstar uses Liebert electronics for its shipboard online double conversion models, which offer the ability to add additional battery trays for extending runtimes. Mounting rail kits included. They all feature emergency power off connections (EPO) for connection to external fire alarm or panic button. Powerstar uses the APC Smart-UPS© SMT series electronics for its PS6000rm series. The PS6000rm units offer the highest efficiencies of any UPS on the market, resulting in less heat conducted through the rack. All can incorporate Ethernet monitoring and communication. These units range in power from 500W to 2,700W. All are 2u-tall and supplied with a rail kit for four-post rack-mounting. The PS6000rm series are upgradable with premium battery cells, which feature a ten-year service and an operating range starting from -20°C to 50°C. With the PS9630 plug-in card, ethernet capabilities are also available. Powerstar’s PS6000 XL series uses APC Smart-UPS© SMX products. A 2u / 3.5in-tall unit, the series features a larger charger to accommodate additional battery cabinets and its high-density battery packaging design offers longer runtimes compared with the standard SMT series. These units can be mounted as horizontally in a rack or vertically. The XL series are compatible with Powerstar Premium battery packs and PS9630 Ethernet cards. Emergency power-off (EPO) contacts are standard. Optional humidity and temperature probe is available. This series offers optional bolt-down / weld-down steel mounting platform with steel hoops for secure mounting and easy removal. All hardware included. Powerstar offers five, ten and 12-year eXtreme rugged battery packs for these models. The units above all use 304 grade stainless-steel chassis to meet the MIL-S-901D/A tests for high shock and vibration-resistance. To reduce costs, Powerstar also supplies these units with their OEM painted steel cabinets if you are not required to meet the high-shock tests. All products listed above use the APC brand electronics. All can be equipped with Ethernet monitor cards. Powerstar offers UPS units with unusual shape layouts for restricted spaces such as yacht equipment bays. The PS6003 2+2 unit is an 18in (457mm) deep, two-piece design with the 2u battery tray separated from a 2u electronics tray, with a 2,700W capacity. PS6002 2+2 1800W also available. The 19in-deep PS6003rm4uXL is a 2.7kW unit with a one-piece design with 4u of rack space. PS6002rm4uXL 1.8KW also available. The PS6000-1 is a 15in-deep, 3u-tall 984W 1.5kVA UPS in MIL-S-901D/A build-stainless cabinet. Powerstar offers single, dual and three-phase UPS for high-power requirements. In addition to the single or dual-phase 6kVA / 6kW PS6006SRT unit, the company offers single, dual or three-phase WYE PS6008SRT 8kVA / 8kW and PS10000SRT 10kVA / 10kW. Delta/Wye transformers are available. Powerstar has developed solutions with engineers from Carnival, L-3, NG, GD, Electric Boat, Newport News Shipbuilding, Lockheed, Boeing, USGS Earthquake Centers and National Severe Weather Warning. The company also produces UPS for outdoor enclosures, high-performance, long-life replacement battery packs, isolation transformers, and voltage converters. Accessories include power distribution units (PDU) and rack-mount kits. All products are UL and FCC listed. Powerstar PS6000rm2u SMT 18in deep 1.5KVA rack mount Shipboard UPS 3.5in H x 17in W x 18in D.
All units listed are modified for shipboard duty by Powerstar Inc in the US. Ruggedisation for shock and vibration is available on request. Powerstar's small, lightweight, economical 120V AC UPSs come in three power ratings, 550VA, 650VA, and 750VA. You can replace non-delta power UPSs or surge suppressors with the world's lowest cost shipboard delta power UPS.